Hey, Friday is almost here! 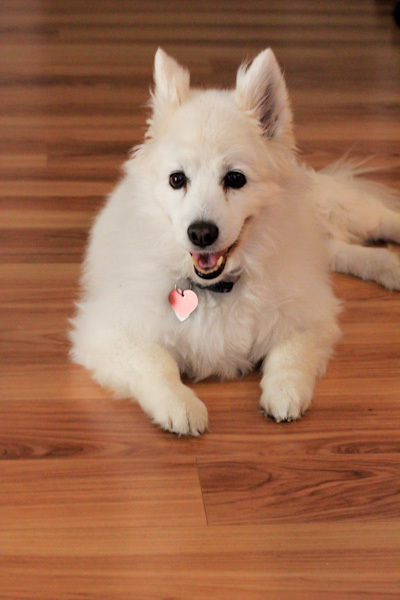 And we’re still chugging along with our house guest this week – my dad’s 15-year-old husky mix. She’s an absolute sweetie, but she can eat! She’s decided she’d rather have our dog’s dinner than her own special food, so I spend dinner time blocking her from the other dog’s bowls while they eat. And she’s fast when she wants food! 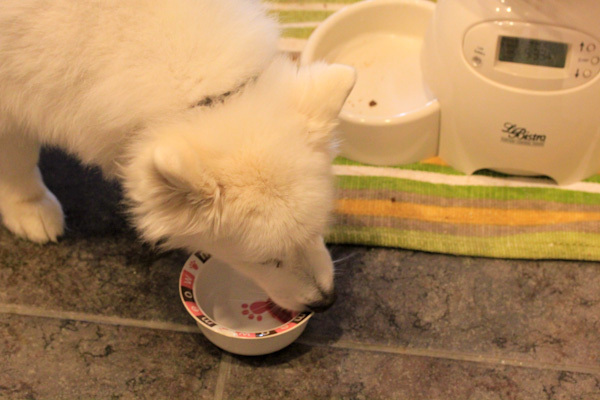 She rushes over to the bowls as soon as they’re done to lick the bowls clean. Notice the empty cat food feeder also… apparently she likes cat food too. I like sweet and tangy salads and got a little crazy with new tahini dressing tonight that included a banana. It’s thick, sweet, tangy, savory, and creamy all at once. 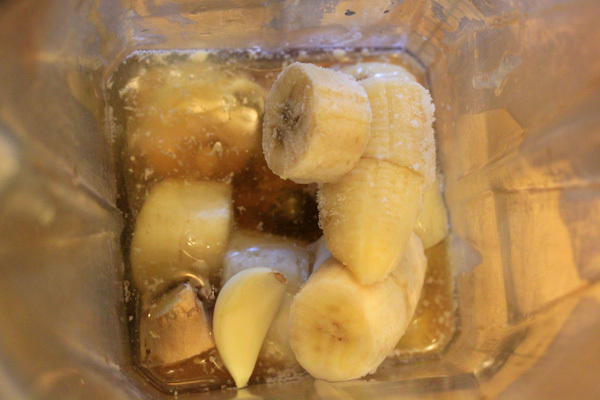 Frozen banana chunks work fine too and I always have a stock pile in the freezer for smoothies. 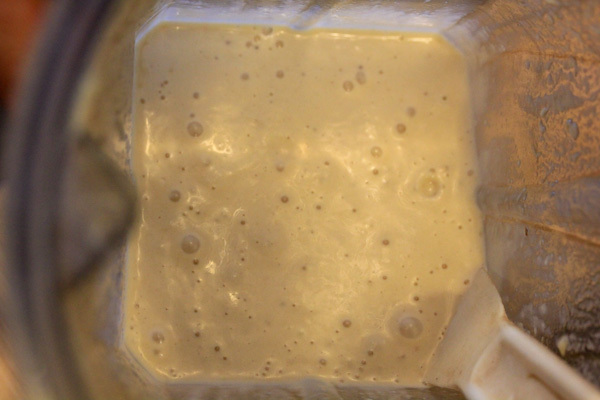 The texture is light and whipped, but still creamy and stirs into a large salad easily. 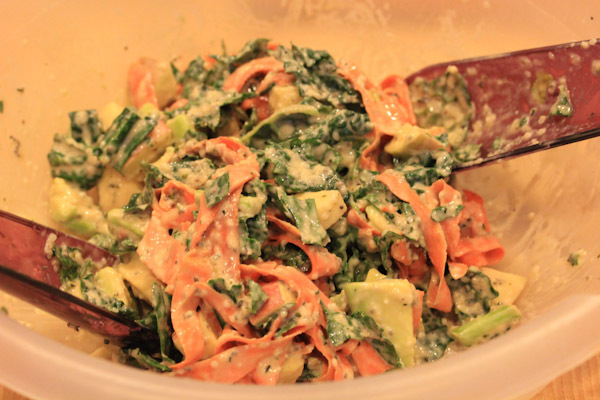 I mixed it into a huge kale salad with avocado, carrots, apple, and hemp seeds. 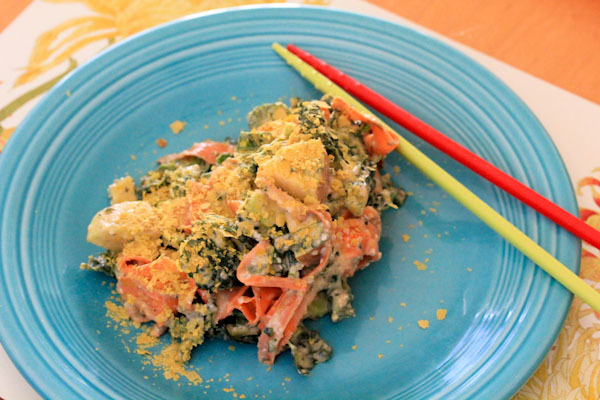 And topped my serving with nutritional yeast for a meal salad. The dressing adds a savory, sweet, and tangy flavor party to the salad while complimenting the crunchy veggies with a creamy texture, perfect for a light, but hearty dinner salad. And hopefully the leftovers will be for lunch tomorrow too. Often I pack raw salad leftovers with the dressing already on because it seems to preserve the greens better. But that dressing can get a little runny the second day. A good tip I’ve been enjoying for that is to mix in a tablespoon or so of chia seeds into the salad to absorb extra liquids and add a fun, tapioca-like texture to the salad.